Read more about Call Your Councillors! 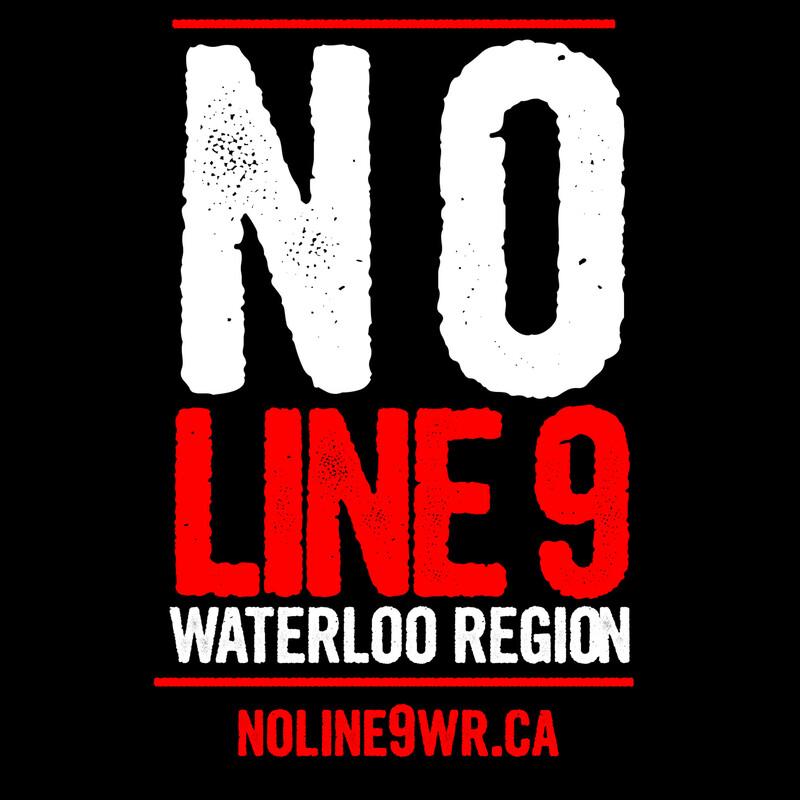 On September 27th 2023, the Waterloo Region Coalition Against Line 9 Presented at the monthly general meeting of the Grand River Conservation Authority, urging the council to release a statement of concern on dangers of the Line 9 pipeline. Settler responsibilities to the Haundenosaunee was also stressed in the 10 Minute Presentation. While some council members were obviously interested in the topic, the GRCA took no action to address the specific threats to the Grand River watershed posed by the pipeline. A question period and discussion followed the presentation and is also presented here. The "Climate Change Containment Unit" (CCCU) is in action today at the site of an Enbridge emergency response exercise in North Dumfries where the controversial Line 9 crosses the Grand River. A\J got exclusive first access to the news. Arriving in a flotilla of three canoes, the CCCU joined the simulated spill exercise with mock hazmat suits and oil spill clean-up equipment – and banners protesting the Line 9 reversal and the potential impacts to the Grand River. WHEN: Wednesday, September 18, 6:00 p.m.
As the National Energy Board prepares to take public input on Enbridge Energy Inc.’s proposal to pump tar sands bitumen through Line 9 — a 38-year-old pipeline that crosses through Waterloo Region — a local coalition of over 20 groups is urging the Region to take a stand against the controversial project. On Wednesday, local residents concerned about the pipeline project will hold a rally outside before presenting in the council meeting. Concerns cited by the coalition include Enbridge's abysmal safety record, with over 800 spills in the past decade and widespread failure to comply with safety requirements, and the particularly severe environmental risk posed by diluted bitumen as opposed to regular crude oil. Additionally, Enbridge's proposal has been advanced without proper consultation of affected Indigenous communities, which puts the project in violation of numerous treaties. These concerns and others are articulated in the coalition's Declaration of Opposition to Line 9, which will be presented to council. Join us at the rally and council meeting to hear why the wide range of local groups are saying 'no' to Enbridge's Line 9 reversal. Members of the coalition will also be presenting at the Grand River Conservation Authority’s monthly meeting on Sept. 27 and at National Energy Board hearings, which will take place from Oct. 8-11 (Montreal) and Oct. 16-19 (Toronto). WATERLOO REGION — It runs straight across the region’s southern edge, under rivers and roadways, pumping a steady stream of crude oil beneath our feet. The pipeline, known as Line 9, has been buried under the Grand River and North Dumfries Township since the mid-1970s. It’s a major artery for foreign crude headed west to refineries in Sarnia, long forgotten and hardly noticed by residents here. But a proposed change to Line 9 is bringing new concerns about the safety of the 40-year-old pipeline. Environmentalists warn that a plan by Calgary-based Enbridge Pipelines to reverse the direction of flow and start pumping crude oil eastward from Alberta could expose our region to contamination. They warn that if Enbridge begins pumping watered-down bitumen crude from Alberta’s oilsands, a more corrosive version of light crude oil, the decades-old pipeline could be pushed to the limit. They point to a major spill in the Kalamazoo River in Michigan after an Enbridge pipeline carrying bitumen ruptured less than three years ago, spilling 3.3 million litres of oil. That pipeline was of similar vintage as Line 9 and likewise not built for this new, riskier kind of crude oil, activists argue. Greetings, fellow Line 9 opponents! No Line 9! Toronto rally at NEB Hearings! Oil giant Enbridge wants to use Line 9, a 38-year old pipeline to pump toxic tar sands east through Ontario and Quebec. Line 9 passes within 50 km of an estimated 9.1 million people, 18 First Nation communities, and 99 towns and cities, including Toronto. Read more about No Line 9! Toronto rally at NEB Hearings!